For Hinduism deity, see Hayagriva. 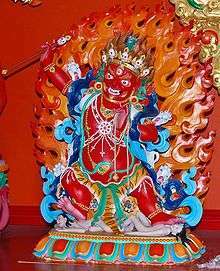 Hayagriva statue in Samye Ling. Note the green horse's head on top of his head. In Tibetan and Japanese Buddhism, Hayagrīva ("having the neck of a horse") is an important deity who originated as a yaksha attendant of Avalokiteśvara or Guanyin Bodhisattva in India. 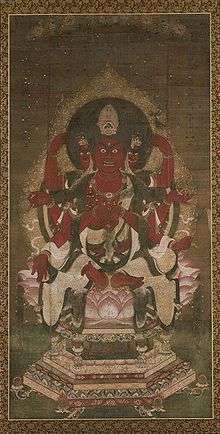 Appearing in the Vedas as two separate deities, he was assimilated into the ritual worship of early Buddhism and eventually was identified as a Wisdom King in Vajrayana Buddhism. In Tibet, Hayagriva was promoted especially by Buddhist teacher Atiśa and appeared as a worldly dharmapala. His special ability is to cure diseases, especially skin diseases even as serious as leprosy, which is said to be caused by nāgas. Hayagriva statue beside a country road in Japan. In Japanese Mahayana Buddhism, Hayagriva is considered as a Avalokiteśvara with wrathful form (Batō Kannon 馬頭觀音, lit.Hayagrīva-Avalokiteśvara) , one of the six Avalokiteśvaras intended to save the sentient beings of the six realms: deities (deva), demons (asura), human beings, animals, hungry ghosts, beings of hell. Hayagriva's sphere is realm of animals (or beings whose state of mind are animal-like). In Folk religion in Japan, Hyagriva was also worshipped as the guardian deity for horses because of its name Horse-head (Batō). The horse was symbolized as a vehicle, not as one of Hayagriva's heads. Hayagriva, known as Batō Kannon in Japan. In his simplest form Hayagriva is depicted with one face, two arms and two legs. Everything about him is wrathful - a scowling face with three glaring eyes, a roaring mouth with protruding fangs, a pose of warrior’s aggressiveness, a broad belly bulging with inner energy, a sword raised threateningly in his right hand (poised to cut through delusion), his left hand raised in a threatening gesture and snake ornaments. This terrifying aspect expresses compassion’s fierce determination to help us overcome inner egotism and outer obstructions. Wikimedia Commons has media related to Hayagriva. 1 2 3 Lopez 2013, p. 346. ↑ Hugo Kreijger (2001). Tibetan Painting: The Jucker Collection. Serindia Publications, Inc. pp. 106–. ISBN 978-0-906026-56-4. Retrieved 23 June 2012.